The following is an excerpt from The Art of Dramatic Writing by Lajos Egri. You can read more of the excerpt here. 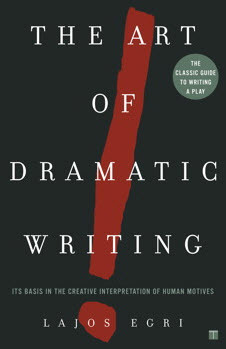 You can order The Art Of Dramatic Writing by Lajos Egri on Amazon.com. Copyright © 1946, 1960 by Lajos Egri. All rights reserved. Reprinted with permission of the publisher. Lajos Egri was born some sixty years ago in the city of Eger, Hungary, and wrote his first three-act play at the age of ten. For more than thirty-five years he has written and directed plays in Europe and the United States. He was director of the Egri School of Writing in New York City for many years. He now resides in Los Angeles, California, where he is teaching and working with members of the film industry.